Get gabby with your tot with these easy — and fun — ideas to get her talking! “Create an interactive experience by making books come alive for your child,” says Roberta Michnick Golinkoff, Ph.D., educator and three-time author on this subject. “When you are reading together, pick up on your child’s interests then relate the content of the book to his life. If there’s a picture of a dog, say, ‘That’s like Grandma’s dog. Where else have you seen a dog?’ That way he’ll link what he sees in the book to his own experiences.” Don’t rush to get back to the book if he’s talking — let him talk! “Children often have a favorite book they want to hear time and again, and that’s OK,” says Golinkoff. 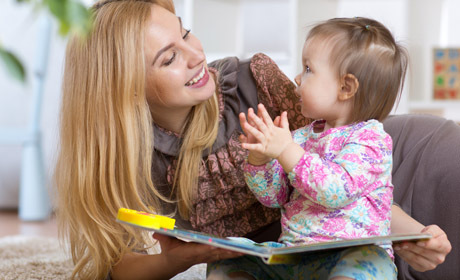 “Repeated readings build a toddler’s vocabulary and story structure understanding.” Amy Vitsorek found this to be true. “Right now my 2-and-a-half- year-old Maggie is into princesses, so every day she carries around a suitcase that has four princess books in it. She’s memorized the storyline and tells it in her own words by looking at the pictures. Then she’ll ask me to read it to her,” she says. “Take trips to venues that have programs specifically designed for children,” says Nelson. “Children’s museums have a variety of exhibits so toddlers can learn words about opposites such as wet and dry, big and little, up and down. If you go to other sites such as natural history or art museums, scale it down to your child’s level. Focus on vocabulary and point out the animals, flowers, shapes and colors you see.” Middle Tennessee boasts several great kid-friendly attractions like Adventure Science Center, Nashville Zoo, Discovery Center at Murfree Spring, Cheekwood, Country Music Hall of Fame and Museum, Frist Center for the Visual Arts and others. “Last year when we took Conner to Nashville Zoo, I pointed out different animals such as a giraffe and talked about its long neck and big, brown spots,” says Danielle Jackson of her now 24-month-old. “Later if we saw an animal on TV or in a book, I’d remind him of our trip and encourage him to say its name and make the animal sound.” Also encourage him to talk about his trips with others. “When you take walks, point out different things and bring back leaves, rocks and sticks so you and your child can count, sort and explore more,” says Golinkoff. With babies it was nice to use “babyese” or a sing-songie voice to soothe the child, but now, as a preschooler, drop the falsetto voice and be real. Speak in sentences without altering your own vocabulary so your child can ask you what you mean. Learning vocabulary is a life-long endeavor that never quits so keep words growing. All kids will start talking when they’re involved in a fun activity. Get down on the floor and play with your child with a toy he loves. Let him lead the way. Ask, “What are we playing?” and let him be the leader on the activity even if it takes forever. The point is, don’t tak over and fill in the blanks. Let him talk! “Before going to bed, rehash the day’s activities to cement vocabulary your child used during the day,” says Golinkoff. “Or encourage him to recount his experiences to another adult with your assistance.” Ask him about funny words, new words and words he knows. • READ — It's the single biggest way to increase and build vocabulary. • LISTEN — Pick up new words from people you talk to. • VOCAB NOTEBOOK — Write new words in a fun notebook just for your child. You can also paste words cut out of magazines. • USE A DICTIONARY — Write down word meanings once you've discovered them. • INCORPORATE NEW WORDS IN CONVERSATIONS — Once your child has new words, encourage him to try them out. Denise Yearian is a former parenting magazine editor and the mother of three children.